My Jordanian meal has to one of my favourite so far. So simple but so delicious. 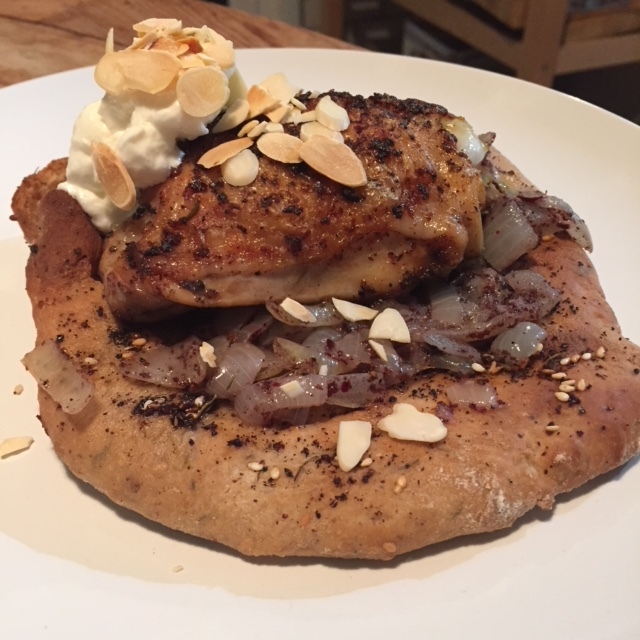 I made a dish called Musakhan which is, in a nutshell, chicken and onion on a flat bread. The flatbread is called Taboon which I made using a recipe from the BBC Food website. The dough is flavoured with Za’atar and Sumac and then baked in a hot oven. Most supermarkets sell Za’atar and Sumac now so they are easy to come by – just look in the herbs and spices section. The onions were fried in a lot of olive oil, drained and then tossed in sumac which turns them a lovely red colour. I used skin-on bone-in chicken thighs and fried them in olive oil until cooked. I then assembled the musakhan by piling up onions on top of the bread, followed by a piece of chicken and then baking everything for ten minutes. Absolutely delicious and quick to make!